Thank you so much, Kirkus Reviews. A culture writer and cookbook author leaves New York City to reconnect with her roots in this humorous and heartwarming story about cows, Indian culture, and the strength of female friendship. Despite being born and raised in India, Narayan (Monsoon Diary: A Memoir with Recipes, 2003, etc.) spent most of her adult life in New York. With her parents and in-laws beginning to age, she decided to pack up and relocate her entire family to Bangalore as a way to be closer to her older loved ones and to reconnect herself and her children to their cultural roots. Everything about their new home seemed different from the familiar comforts of New York, but one thing stood out more than anything else in her new world: India’s sacred cows and the people who care for them—particularly, a local milk lady named Sarala who grazed her small herd of cows across the street from Narayan’s new home. When Narayan decided to take the plunge and buy Sarala’s fresh milk after doing weeks of intensive online and anecdotal research on the subject, the two formed a fast friendship based on their deep personal connection to their shared Indian roots, love of family, interest in food, and, most of all, desire to find just the right cow for Narayan to purchase for Sarala. At once sincere and laugh-out-loud funny, this memoir chronicles a genuine bond between two remarkable women that transcends class, culture, and privilege. In this beautiful examination of the differences between Eastern and Western cultures as told through the eyes of a writer who is uniquely qualified to comment on both, Narayan’s rich and evocative writing transports readers to the busy streets of Bangalore and a fully formed picture of modern India that includes cow urine tablets, bus crashes, and many different kinds of milk. 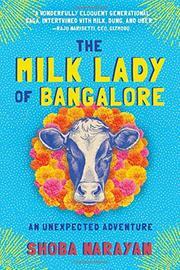 A witty and tender story that endears readers to Indian culture and one of their most sacred symbols, the cow. © Copyright 2017 Kirkus Media LLC. All Rights Reserved.